A province that has the tools to collectively foster ideas and empower individuals to reshape our communities into places where we all want to live. To provide pathways in which we, together, explore ideas and test solutions to complex challenges. 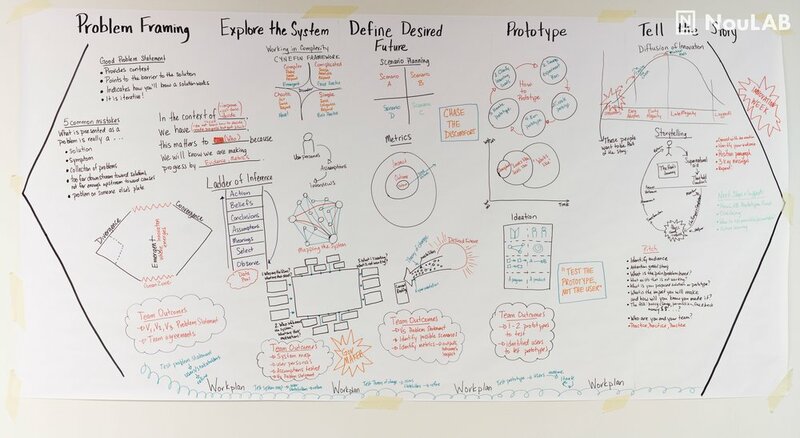 Inspired by MaRS Solutions Lab and GovLab methodologies, NouLAB first convenes the knowledge of diverse stakeholders who understand our greatest challenges; then facilitates a process of problem framing, systems mapping, research, experimentation, and scaling successes; and, finally, connects innovators with influencers. These activities make the change process quicker, smarter, and more sustainable. Let’s not jump to solutions. We promise, we’ll get there, but time and again we build solutions to problems we don’t fully understand. NouLAB helps lab teams intricately understand their challenges so they can be smarter about how they intervene. Lab teams take an iterative approach to intervening on the challenges they want to address. By understanding, acting, learning, and adjusting, lab teams start small and scale interventions using an iterative model. Lab teams are made up of diverse change agents and citizens from the private sector, public sector, social sector and academia. The teams work collectively to understand the nature of their challenge from multiple perspectives, and design, create, and test interventions together, always working towards scale and always learning. NouLAB is designed to address public challenges. Challenges that affect many and ones no single party or institution can solve alone. The status quo isn’t working. We exist to be a trusted, neutral convenor of the change process and care most about changing our legacy systems to get the most desirable outcomes. NouLAB offers the space and process to do this.